• A great deal needs to be done regarding the long term damage already done to Cuba’s terrestrial habitats. • The maritime habitats present an excellent opportunity for long-term conservation and sustainable development efforts. • True success depends on all involved stakeholders accepting that Cuba’s environment has an economic value that is not free for the taking, thus, requiring enlightened regulatory oversight. • Cuba’s poverty must be addressed, particularly among surrounding local communities, as part of any effort aimed at recovering and preserving the island’s diverse habitats and unique species. • A detailed action plan is needed based on outreach and consensus to leverage this unique opportunity to conserve and restore Cuba’s environment, thus making it a permanent aspect of the island’s national reconstruction strategy. There have been mistakes and shortcomings due mainly to insufficient environmental awareness, knowledge and education, the lack of a higher management demand, limited introduction and generalization of scientific and technological achievements, the still insufficient incorporation of the environmental dimension in the policies, development plans and programs and the absence of an integrative and coherent judicial system (Houck and Rey Santos, 1999). The same National Environmental Strategy document goes on to identify soil degradation, deforestation and pollution as key environmental issues. 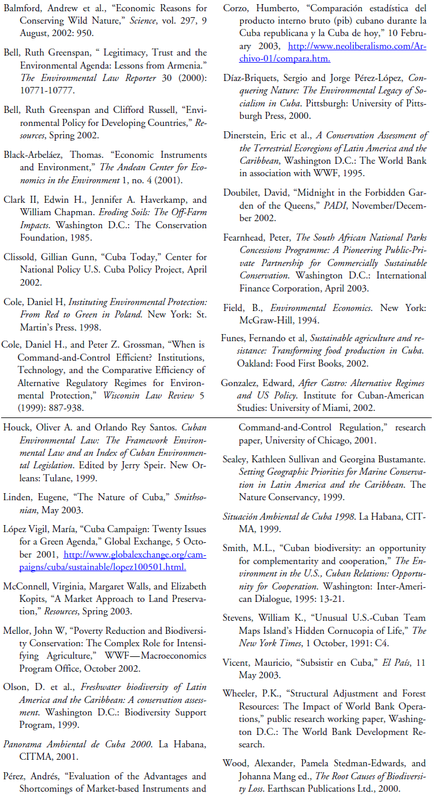 After the U.N. meeting, three editions of Panorama Ambiental de Cuba (1998, 1999 and 2000), have pointed out the same problems plus increasing salinity, the deterioration of sanitation due to poor waste water treatment and decaying sewage systems, and the loss of endemic species, one of Cuba’s most important and abundant natural assets. Cuba’s fresh water system (rivers/lakes/aquifers) has very serious problems. Under Castro’s policy of voluntad hidráulica, which called for not a single drop of fresh water to “be lost” to the ocean, the government has built over 1,000 large and small dams throughout the entire island, covering 1.4% of Cuba’s territory. The results are similar to what has happened in Pakistan’s Indus delta over the last 50 years. More specifically, although the benefits to Cuban agriculture are clear in terms of increased irrigated land (close to 1 million hectares), the ecological effect has been quite negative in terms of lowering the water’s oxygen level and increasing salinity. Dams have also blocked the dispersal of sediment and fresh water runoff over mangrove areas, contributing to a 30% average reduction of mangrove coverage and biodiversity loss. (Panorama Ambiental de Cuba, 2000). Another factor contributing to the increased salinity is the excessive use of aquifer waters for urban consumption and wells for irrigating sugar and citrus crops. Cuba’s major preservation opportunity revolves around its almost pristine coral reefs, which protect a good portion of its coastline. Unlike true barrier reefs, the lagoons behind Cuba’s reef are very shallow. In most cases, these wide lagoons, together with the long archipelagos of small coral cays that lie on their outer edges, have protected the reefs from the adverse impact of land-source pollution. Presently, only short stretches of coast are heavily urbanized or industrialized, thus, pollution tends to be localized. Although a significant degree of organic pollution is present in major bays, it is thought to affect only a small portion of Cuba’s reefs. Also, it should be noted that there has been extensive exploitation of black coral for jewelry production. In 1998, coral bleaching was reported to have been severe on all coasts, although bleaching-related mortality was low (World Atlas of Coral Reefs). As previously mentioned, the majority of these reefs lie offshore in long tracts that resemble barrier reefs, separated from the main island by broad lagoons. The longest is the North Central system, which runs along the north coast from the Archipelago de Sábana to the Archipelago de Camagüey. On the south coast, the Jardines de la Reina reef stretches from Trinidad to Cabo Cruz and is considered to be among the healthiest in the Caribbean. This system and the Batabanó system enjoy the largest and most diverse shelf habitat in the Caribbean, plus mangroves and extensive seagrass beds. The Nature Conservancy and the University of Miami published in 1999 an analysis of 57 coastal systems in the Central Caribbean in an effort to set marine conservation priorities. Three of the eight ecoregions in Cuba were judged to be of the highest priority (see Table 1). These three systems harbor diverse habitats as well as encompassing 40% of all coastal mangroves in the Central Caribbean, or close to 6,000 km. Fortunately, some coastal areas are already protected, such as the Punta Francés National Park, on the west coast of Cuba’s Isle of Youth. The Wildlife Conservation Society helped get it designated as a United Nations World Heritage site, thereby protecting its endangered black coral. The island’s initial post-1958 economic development model was based on the takeover of most private agricultural land, the implementation of the Soviet centralized planning model of large state farms, and the consolidation of small farms into agricultural cooperatives. This model required large land areas, oil-driven mechanization, river damming, and heavy use of agrochemicals. Little regard was given to soil husbandry in terms of compaction, erosion and loss of fertility (Funes et al, 2002). This exploitative approach, the use of marginal land for cultivation and inadequate environmental management of resources are some of the root causes of Cuba’s serious habitat degradation, salinity and soil desertification. This was confirmed by Cuba’s own Panorama Ambiental de Cuba, 2000, which noted that 15% of Cuba is affected by salinity and 43% by erosion. The good news is that despite Cuba’s 500 years of environmental resource misuse, the island is somewhat better than its Caribbean neighbors due to the lack of sustained economic development and a sharp reduction since the early 1990s of agrochemical usage. In addition, the government has attempted to reverse past logging damage. Since the early 1960s, a large reforestation project was initiated, with particular emphasis on large monoculture plantations, resulting in (as in the case of Chile) a substantial increase in Cuba’s forested area to 21% by the 1990s, but a reduction of native tree coverage. More recently, the Cuban government has realized the economic potential of its biodiversity and has started to take necessary steps toward preservation. Still, although Cuba claims that areas with some type of protection encompass 22% of the national territory, many of these 236 so-called ecological preserves are simply “paper parks,” allowed to stagnate due to the lack of resources and enforcement. According to Dr. Michael Smith of Conservation International, when compared to the United States and Canada combined, Cuba has 12 times as many mammal species, 29 times as many amphibian and reptile species, 39 times as many bird species and 27 times as many vascular plant species, on a per hectare basis. Also, Cuban endemism, which refers to the exclusive presence of species in a specific location, is quite high (Smith, 1995). For instance, 52% of plants are endemic to the island. As unique habitats were eliminated for the sake of increased sugar, citrus, coffee, rice and cattle production, Cuba’s rich biodiversity and endemism have been and continue to be pressured. For perspective, based on a 1994 report from the World Conservation Monitoring Centre, among Cuba’s 6,500 plant species (for comparison, North America has 18,000), 1,149 are threatened. Animal species have been less studied, although they also show high levels of endemism and dwarfism. Cuba has a small number of vertebrates (54), as well as 350 birds, 121 reptiles and 46 species of amphibians. Of these, 128 are at a critical, endangered or vulnerable level. Cuba’s best known endangered species, Crocodylos rhombifer, is one of 23 crocodile species in the world and has one of the most geographically restricted distributions. Its only habitats are some remote marshy zones of Zapata. Cuba enjoys a notable biodiversity in mollusks—2,940 species have been identified, of which 1,400 are terrestrial and include the critically endangered Polymita tree snail. These snails have magnificent colors and designs and over 80% of them are endemic. For perspective, France has only 400 species of mollusks (Lopez Vigil, 2001). The island also shelters, among its many dwarf species, the world’s smallest scorpion and smallest bird, the bee hummingbird. Cuba is broke, with a per capita foreign debt ($3,000) that is one of the largest in the world and a Moody’s credit rating of Caa1, which is considered to be “speculative grade.” The balance of payments account deficit continues to worsen, further increasing devaluation pressures. Rather than following China’s and Russia’s example and conducting their foreign policy in pragmatic terms, for ideological reasons Cuba has refused to deal with the IMF. Thus, at this point, a long-term solution via debt renegotiations is not an option, thus eliminating future foreign funding. In addition, with the highest ratio of population over 60 years of age (14%) in Latin America, Cuba faces the long-term challenge of caring for a fast-increasing aging population (21% by 2020), placing further pressure on its limited finances (González, 2002). Since 1959, the Cuban revolution has accomplished significant gains in providing the poor with a social safety net in terms of education and health, although a serious housing shortage persists. However, Cuba has failed miserably in creating a dynamic economy capable of generating individual wealth. Over a forty year period, the island has gone from one of Latin America’s wealthiest countries to one of the poorest. 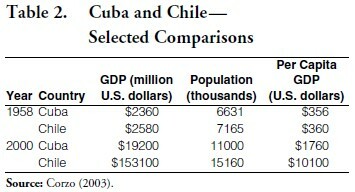 For perspective, in 1958, Cuba and Chile’s per capita incomes were about the same (Table 2). During the 1960-2000 period, Cuba faced a number of years of negative gross domestic product (GDP) growth, and the result for the average Cuban has been dismal. For perspective, Chile’s per capita income grew 28 times vs. Cuba’s 5 times during the 1960-2000 period. Unfortunately, economic indicators are not improving. The latest indices show sugar production, tourism, new home construction, electric power generation, etc. are trending down. The Cuban government, with its libreta de racionamiento (ration card), has attempted to provide its population with a minimal 7-10 days caloric input each month. For instance, on a monthly basis, each person is only entitled to 2.7 kilograms (kg) of rice, 2.2 kg of sugar, 0.5 kg of beans, and 450 grams of chicken, as well as a liter of milk for children under seven years of age. This forces Cubans to complement their nutritional needs by either purchasing expensive food on the black market or shopping in the agromercados, which operate under market-driven conditions, or via bartering. The combination of low monthly salaries (average 221 pesos, about $10US at the unofficial exchange rate used by government-operated foreign exchange outlets), limited allotments of subsidized food, and relatively high prices for the available non-subsidized food forces people in Cuba to steal and engage in other anti-social activities. According to a 2001 study by Cuba’s Centro de Investigaciones Psicológicas y Sociológicas (CIPS), more than 90% of Cuban households are involved in some type of illicit activity to complement the State’s food and clothing allotment (Vicent, 2003). We can conclude without fear of contradiction, that the average Cuban citizen is very poor. Survival skills include the social institution of “resolver” (stealing from the government) which leads to activities such as cutting down trees for fuel, and selling endangered species such as the Cuban parrot and Polymitas for profit (Linden, 2003). The economic situation has tremendous significance in the development of any future environmental strategies in Cuba. Just as in the poorest areas of Brazil, Ecuador, the Philippines or Africa, we must be aware of the effect of surrounding poverty and institutionalized individual behavior on the development, execution and success of any specific program aimed at preserving biodiversity. In other words, if poor Cubans are not provided with alternative income opportunities, conflicts and local opposition will develop to the creation of ecological preserves and other conservation efforts. The development of a viable environmental strategy for the tomorrow’s Cuba must incorporate a significant element of sustainable development in order to neutralize the surrounding poverty via income raising measures. A continuation of resource exploitation will bring a further downward cycle of environmental degradation combined with worsening poverty. The best example of this phenomenon in the Caribbean is Haiti, which has very little (1%) of its original forest cover and deep poverty. Any future conservation strategy must also reflect a clear understanding of the today’s Cuba. It must clearly recognize and address the past misuse and exhaustion of natural resources (water, forests, etc.) as a tool of the State’s failed fast-track economic development efforts and clearly define how these terrestrial environmental effects should be reversed. The good news is that the lack of coastal development, in particular, presents an excellent opportunity to do things differently in Cuba. For instance, Cuba could easily leverage the almost pristine coral reefs and coasts, which lend themselves to a Belize-like ecotourism- based strategy, and avoid the mistakes and excesses of places such as Cancún and the Spanish Mediterranean coast. Looking ahead, care must also be taken to avoid falling into the trap represented by any type of shortterm- oriented free market approach that calls for unregulated foreign investment. The future of Cuba’s environmental sustainability depends on changing its 500-year old mindset, where environmental resources and services are considered to be free for the taking by locals and/or foreigners simply interested in making a quick profit. On the other hand, if done properly the island’s well endowed environment can become a permanent asset in any future economic strategy where tourism will surely play a key role. This will require enlightened regulatory oversight and dialogue with the business world to encourage economic growth while assuring conservation. Our intention is to create a conservation Trust Fund whose main strategic thrust will be to rescue, defend, and preserve the scientific, cultural, economic, and aesthetic values of Cuba’s unique national natural assets for the benefit of current and future generations. This will be accomplished by establishing an efficient, science-based not-for-profit organization. This private organization will provide a stable and nonpolitical source of funds for environmental education, biodiversity conservation, and sustainable programs aimed at combating poverty. • Start generating the outreach and bridge building needed to build consensus. • Work with the opinion makers (media, etc.) to increase public awareness via education regarding the importance of preserving Cuba’s biodiversity due to its socioeconomic, cultural and aesthetic values. • Create a website that will seek to educate the reader about the status of the Cuban environment and serve as a link to related web-destinations. The Trust Fund will be based on four pillars essential to its success: (1) a clear strategic vision, (2) transparent governance, (3) efficient financial/operational procedures, and (4) a consultative approach among all key stakeholders. In addition, and probably most important to its success and credibility, is that this new Trust Fund must be able to tap into the Cuban- American community’s desire to help revitalize the Motherland. The proposed Trust Fund should begin working with a select group within the Cuban-American community as well as key opinion makers in Washington, conservation organizations and the Cuban media in South Florida. The media must play a vital part in selling, emotionally and objectively, the idea of the importance of conserving Cuba’s natural resources. There is a political aspect to the proposal beyond Phase I that requires further discussion at all levels beyond a normal environmental project. In order to move beyond Phase I’s focus on science and education, the Trust Fund must generate very clear operating criteria. More specifically, it will not move from Phase I to Phase II until the Cuban political system allows truly independent NGOs to operate and obtain support from outside funding sources. In addition, it is important that transparent regulation and oversight exist. Since the mid-19th century, Cuba has had excellent scientific libraries and biodiversity collections such as the one located in Cienfuegos that were shared with a number of foreign institutions. Close cooperation between Cuban and U.S. scientists existed prior to 1959, although very little took place during the subsequent 30 years. Since 1990, a limited opening permitted U.S. and Cuban scientists to collaborate, and as a result, a number of documents that provide a basis for understanding the present environmental situation have been published. In addition, Tulane University has done a great deal of work regarding Cuba’s Environmental Law and Environmental Defense and is working with Cuban scientists conducting basic research and co-sponsoring workshops aimed at maritime conservation. We intend to include all of these materials plus the findings from the research described below in a website. Step I should start with a relatively quick gap analysis aimed at reviewing existing research literature regarding the status of Cuba’s environment and its unique species, which will highlight knowledge gaps. The analysis should be followed with aerial and satellite imagery aimed at assessing the current situation and changes since the l960’s. Based on preliminary work done by Díaz-Briquets and Pérez-López, this initial analysis would include examining Cuba’s: (1) forest cover, with particular emphasis on desertification, salinization and forest make-up, including inroads by the pest plant marabú; (2) coastal areas, with particular emphasis on pollution in bays and estuaries, the effect of the Dique Sur infrastructure in the southern region of Havana and the effects of pedraplanes (earthworks) connecting a number of cays along the northern coast; (3) industrial consequences of the sugar industry (particularly waste and the aquifers), as well as nickel strip mining and overall industrial pollution plus, (4) dams and how they have affected the flow of fresh water and surrounding habitats. • Current environmental legal structure and its implementation. The envisioned initial working group will be small and limited to those key strategic players willing and able to fully participate and support this effort in terms of time, funds and resources. This group will be composed of representatives from (1) the Cuban- American community (will provide funding), (2) a corporation (will provide a bridge to the business world), (3) a major conservation NGO (will provide resources, know-how, and contacts), (4) a Floridabased university (will provide context to the science and education effort), and (5) the Cuban-American media (will provide public support). Once the group is formed, its initial priorities will involve approving the Trust Fund’s vision statement and strategy as well as its initial conservation and preservation priorities. Long-term, the Trust Fund’s main objective would be to carefully select local NGOs and provide them with a permanent, independent, and non-political source of support and income. The conservation projects could be either government or privately sponsored as long as they contribute in a sustainable manner to solving environmental issues and poverty elimination. Complementary support will be provided by the Trust Fund to local communities and NGOs in order to strengthen their own organizations and help them build their own capabilities. The short-term, two-year funding objective will be to obtain $200,000 in order to pay for the knowledge gap and root cause analyses, as well as legal and outsourced administrative costs and the development and support of a website. Long term, the funding strategy would initially revolve around the creation of a matching three-year $1 million sinking fund to be followed by the creation of an endowment (value to be determined) to support conservation projects. Summarized below are the preliminary elements of a fund raising strategy aimed at obtaining the initial $100,000 in private donations matched with an additional $100,000 from other sources. This will be followed later by the establishment of a $1 million three-year sinking fund. Cuban-American Community: An understanding of the importance of the Cuban-American community’s role in this funding strategy is critical. Despite its relatively small size (4% of all Hispanics) and recent arrival to the U.S., the Cuban-American community’s financial and political clout is considerable. This political influence can be quantified in terms of four members in the U.S. Congress, one Cabinet secretary, plus key jobholders in the Bush and previous Democratic administrations. Aside from the Jewish- American PAC juggernaut, the Cuban-American National Foundation is the second largest ethnic PAC in the nation. This combined influence will be refocused into obtaining significant American and foreign support (including environmental) for a post- Castro Cuba. Despite legal restrictions, in 2000, Cuba received $720 million in remittances from the Cuban diaspora, more than the $453 million generated by sugar, Cuba’s number one export. For a perspective of the magnitude of the remittance, the nearly $4 billion in cumulative remittances during the 1989-2000 period was twice the accumulated foreign direct investment for the same period. More recently, according to the Inter-American Development Bank, Cuba’s remittance grew to $1.1 billion in 2002, despite the world economic slump. If only 1% of this significant individual funding capacity could be redirected to the environment, much could be accomplished by not only preserving its maritime treasures, but also rescuing Cuba’s degraded terrestrial habitats for the benefit of future generations. U.S. Conservation Foundations: There are presently about 60 U.S. foundations focusing on biodiversity conservation in Latin America; however, only a few are active in Cuba because of regulatory issues. This low ratio, combined with a keen interest in Cuba, suggests a significant upside potential to broaden the funding sources by eventually tapping the nonparticipating foundations. Our strategy is to approach a grantor institution, before the current Treasury restrictions are eliminated, with a proposal to help address Step I via a matching seed grant of $100,000. Once the restrictions are eliminated, this would be followed with a broader request in order to fund future stages. Corporations: The corporate focus will be both national and international. Prior to 1959, Cuba had an extensive array of foreign corporations (Citibank, Shell, Sears, etc.) operating in the island. Given the appropriate legal and political scenario, it is reasonable to expect that these and other foreign firms will be attracted to return to Cuba. This group should be the core from which we will create a group similar in purpose to Conservation International’s (CI) Center for Environmental Leadership in Business, which is an independent unit within CI, having its own executive board focused on establishing cooperation between the corporate world and CI. According to CI, the Center “promotes business practices that reduce industry’s ecological footprint, contributes to conservation and creates value for the companies that adopt them. The result is a net benefit for the global environment and for participating companies.” Our strategy would call for a similar approach by focusing on the industry segments (banking, mining, agriculture, etc.) with the largest environmental risk. The plan behind the Center will be based on understanding the prospective sponsor’s corporate needs and making certain that this group has a voice, rather than transforming it into an opponent early-on in the Cuban transition. Bilateral Development Assistance Agencies: Following positive political changes in Cuba, a primary thrust for U.S. government funds could be the USAID and the new Millenium Challenge Account (MCA), assuming it is fully funded by Congress. The MCA represents a new approach to providing development assistance and it is the only significant source (over $1 billion a year) of new foreign aid available to poor countries. The goal of the MCA is to reduce poverty by significantly increasing the economic growth trajectory of recipient countries. Alternate sources for major long term funding would be the two units within the World Bank—the Global Environment Facility and the International Finance Corporation—as well as the Inter-American Development Bank, which fund specific sustainable development, poverty alleviation and conservation projects. Others: As explained above, the Trust Fund’s initial priorities would be to work with foundations whose charters emphasize poverty reduction and biodiversity conservation, corporations, the Cuban-American community and bilateral assistance agencies. In addition, the Trust Fund will explore other more sophisticated sources of funding such as Cuba’s debt restructuring, and CDM CO2 projects under the Kyoto Protocol. For instance, a good example of a carbon sequestration scheme, aimed at reducing deforestation, is Costa Rica’s Protected Areas Program. Also, the Trust Fund will work closely with the future Cuban government to propose and help implement tax revenue generating strategies (trust land tax, purchase development rights, usage fees, etc.) and privatization schemes aimed at supporting conservation, similar to those implemented in South Africa. Regarding water pollution, schemes such as Colombia’s successful market-driven Watershed Cap and Charge Program should be carefully evaluated as an alternative to command and control regulations (Black-Arbeláez, 2001). Based on the author’s own experiences in developing a “Return-to-Cuba 1981 Business Strategy,” for a major bank, it is important to remember that even after Castro there could be a number of environmental unfriendly scenarios. Indeed, the Bank analysis developed and evaluated 15 possible scenarios that incorporated multiple socioeconomic, political, human rights variables plus legal issues such as labor, bankruptcy, securities, antimonopoly, and other laws. The analysis concluded that only 1/3 of the scenarios merited a strong investment commitment. Still, if we assume a scenario where independent NGOs can prosper, outside foreign support can take place, and environmental regulations are clear, a number of dynamics must be addressed. An early priority of the Trust Fund will be to encourage and develop a reliable, independent science information base capable of painting an accurate and credible picture of Cuba’s present environmental problems and opportunities. It is important to not only understand the root causes and severity of habitat degradation and specie extinction, but also prioritize the needed preservation and restoration requirements. It should be noted that Cuban and foreign scientists have already done a great deal in identifying a number of sites and endemic species that merit protection, as well as identifying its environmental problems. The expected lack of government resources for its own scientists as well as park support should be solved via the use of outside bilateral help, a worldwide funding strategy, partial privatization, ecotourism, and other sustainable economic development efforts. Most Cubans, whether they reside on the Island or abroad, tend to perceive nature as either infinite or having little value. In other words, the environment is under-valued because it is not perceived as scarce and/or irreplaceable. As part of the process of selling this plan to a broader audience and in setting priorities, it is important to generate the necessary credibility that the environment has not only social, cultural and aesthetic value, but also real economic value that will be critical in Cuba’s future reconstruction. Thus, going forward the Trust Fund must seek to generate the economic facts necessary for promoting longterm conservation. Once conditions are favorable to conducting research that compares sustainable development vis-á-vis resource exploitation, the Trust Fund must seek out expert help in order to be able to determine the fully loaded net marginal benefit of the preserved areas using a sustainable market-based approach. Examples of this approach were summarized in 2002 (Balmford et. al., 2002) in five different countries (Malaysia, Cameroon, Thailand, Canada and Philippines). The evaluation quantified benefits of tourism, carbon sequestration, sediment control, water supply for agricultural and household use, net of administrative expenses. The resulting data was compared to the opportunity cost of not exploiting the natural resource. In each instance, the benefits were larger than the opportunity cost of avoiding habitat conversion. Furthermore, it should be noted that the net result did not include aesthetic and cultural values, preserved biodiversity, air quality, etc. Also, it will be essential to understand the expected post-Castro political and socioeconomic dynamics as well as corruption. These elements could affect the future preservation of Cuba’s maritime treasures as well as the recovery process of its degraded terrestrial habitats. The South African experience (Fearnhead, 2003) teaches that any future national preservation strategy will have to deal with: (1) increased demands by the impoverished local population for meaningful economic benefits and political empowerment; (2) the need to support the creation of local, independent NGOs; (3) the expected increased interest by outside investors looking for quick get-rich investments using (or abusing) Cuba’s natural resources; and (4) the full implementation of Cuba’s environmental law, including needed amendments. From an economic standpoint, when attempting to evaluate the potential overall net effect of structural adjustment loans on the environment, the Trust Fund should be in a position to assist policy makers in evaluating past experience. More specifically, once Cuba is able to have access to the World Bank and the IMF for economic aid, these organizations in return will surely prescribe structural adjustment loans. These adjustment packages are aimed at increasing productive efficiency and economic growth by liberalizing the economy. Historically, environmentalists have opposed these programs claiming they trigger rapid resource depletion and increased poverty. According to the World Bank (Wheeler, 2001) the overall effect of adjustment programs is unclear. With respect to the usual exchange rate policy recommendations, adjustment packages have in fact had a deleterious effect on the environment by (1) increasing deforestation rates and (2) stimulating the expansion of erosive crops. Conversely, fiscal policies have had mixed results, with the elimination of subsidies and cuts in public services generating both positive and negative effects on the environment. Future Cuban policymakers, when designing a pluralistic environmental strategy, will probably use a mix of market-based and command-and-control based elements in order to protect the environment. Command-and-control is a regulatory approach that relies on standards of varies types, such as ambient, emission, and technological (Field, 1994). Meanwhile, the market-based approach uses market tools such as taxes, subsidies, and credible emissions permits to achieve the same purpose. In the context of Cuba’s realities, both approaches have pros and cons that must be critically assessed before implementation. Market-based has the cost advantage of seeking out static efficiency by equating marginal abatement cost across sources. Commandand- control’s standards also achieve emissions reduction but at an undesirable higher cost. Market-based has the advantage of providing strong incentive to innovate pollution technology in the long-run; while this efficiency is only partially met under commandand- control standards. Nevertheless, command-andcontrol has the advantage of depending on less complex monitoring and usually has a simpler implementation (Pérez, 2001). In addition to whatever strategy regulatory policy makers choose to follow, it is important to understand the future legal and environmental regulatory implementation challenges facing Cuba. For perspective, in 1989 President George H. Bush gave a speech in Budapest pledging U.S. assistance for environmental recovery in East Europe. According to Ruth Greenspan Bell, from Resources for the Future, support from the United States and Western Europe was considerable and helped the Easter European countries develop new environmental laws as vehicles for social change. However, implementation of these laws has lagged, particularly in those countries with citizens that are suspicious of laws in general. Thus, she suggests that there should be greater emphasis on implementing conservation projects that are rooted in cultural value systems, traditions, or community needs. The fact that Cuba is an island facilitates any future conservation strategy due to the absence of threats from neighboring countries. Still, it is important to note that grantors and concerned outside parties will judge any effort by the Trust Fund in the context of the Caribbean, given its rich biodiversity and Hot Spot designation. Thus, aside from Cuba’s conservation/ poverty linkage, which has already been described in detail, it is important to keep in mind cross-boundary policy linkages as well as the ability to replicate any proposed program beyond Cuba. This should not present a problem to the Cuba of tomorrow given its deep scientific talent pool that will help Cuba’s future case for funding among grantor institutions.